Emidio Pepe is the producer of ultimate Montepulciano d'Abruzzo. Whole process of wine making is managed by natural and artisanal method. This is a bottled nature and human soul. These bottles are released after long ageing period. The wines are non-filtered and those bottles are decanted one by one, manually, before releasing. The wine loses nothing and full detail is remained in the pure extract. This classic-styled fully mature wine has great complexity and natural sweetness. The vineyards have been managed by Biodynamie for long time and it is certified. After the strict selection of grapes, red grapes are de-stemmed by hand in wooden tubs and white grapes are pressed by feet. The fermentation takes place in small concrete tanks, with natural yeasts. After the first bottling, wines are moved to underground cellar, and spends many years and sometimes several decades. Before releasing the bottles to the market, all the bottles are hand-decanted instead of filtration. 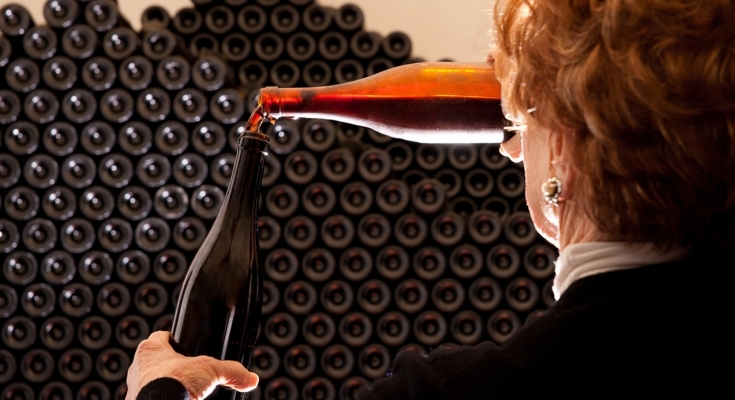 Rosa Pepe decants the wine from one bottle to another, to eliminate the natural sediments.